Companies across the globe are making significant investments in improving customer experience. Yet research indicates the key ingredient to improving customer experience (CX) is making a comparable investment in improving the employee experience (EX). According to Gartner by 2019 81% of organisations will want to successfully differentiate based on CX. Successful CX lies in the ‘moments that matter’ – the vital experiences a customer has with your organisation. Ideally, these moments are consistent and accurately reflect the organisation’s desired brand and culture. Increasingly research is indicating that the customer experience ‘starts at home’ with an engaged workforce as the driver. A Jacob Morgan study that entailed analysing financial performance data and best place to work lists concluded that organisations who invested heavily in EX were “four times more profitable than those that didn’t and had at least two times the average revenue”. Organisations with exceptional EX enjoy benefits like greater employee engagement, improved productivity and the ability to attract and retain talent. In a recent study, 83% of HR leaders indicated they rate EX as “important” or “very important” in regards to their organisation’s success. Without a dual focus on EX and CX, taking into account the ‘moments that matter’ for both employees and customers, organisations seeking to execute an experience-based value proposition will ultimately fail to deliver. Millennials are entering the workforce at an ever-increasing rate – and by 2025 will make up 75% of the global workforce. While a change in employment priorities is to be expected from generation to generation, it is widely reported that millennials have significantly different priorities from previous generations. Primarily purpose driven, millennials value company culture over everything else (including pay), wish to contribute to the ‘greater good’ and want to have a visible and lasting impact on the company. As a result, organisations need to be equipped to meet different employee expectations across multiple generations. It is critical they start to intentionally design experiences for different employee segments in the same way they do for their customers. Most of us are aware of the impact of the digital age and how this is fundamentally changing the way we interact with organisations. We now live in a world where customers and employees expect greater convenience and choice due to the increasing number of interactions shifting from a human to a digital interface. We are becoming more comfortable utilising self-service options (with studies estimating that at least 67% of customers prefer self-serve over speaking to an employee). This trend is impacting employee tolerance for outdated systems and software. Organisations are being forced to invest in technologies with user-friendly interfaces that enable employees to source answers to their questions, access information whenever and wherever they like, and collaborate more seamlessly with others (e.g Slack, Google Hangouts, GoCo.io and TinyPulse). In light of this shift we need to understand the digital needs of employees and provide technology throughout the employee lifecycle that meets or exceeds their expectations. Despite a strong body of research, organisations have been slow to invest in EX. Many choose to focus almost exclusively on CX leading to many initiatives failing to deliver on their promise. 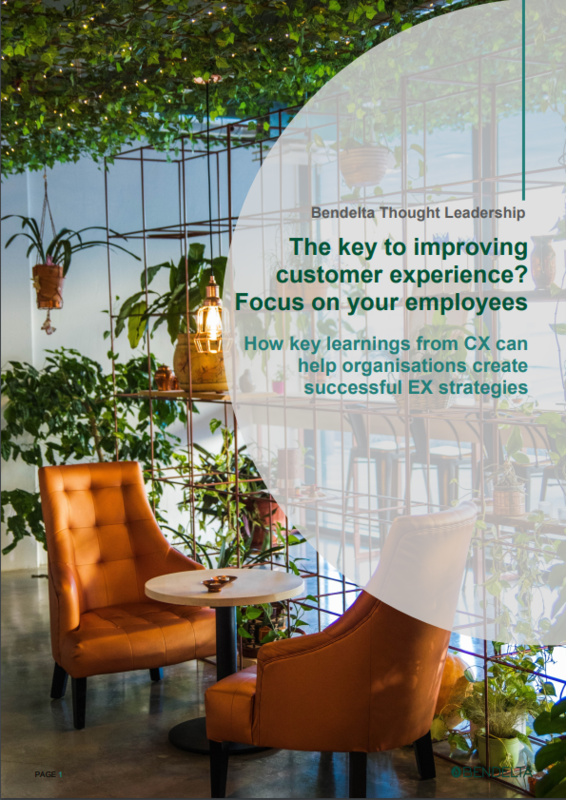 However, a growing number of organisations applying a dual focus to their experience strategy are successfully applying learnings from CX to EX. Employees (like customers) expect tailored experiences based on their unique preferences – One size does not fit all! It is necessary for organisations to offer personalised experiences for employees, throughout the employment lifecycle based on their specific needs. Co-design to create frictionless employee experiences. Employees want access to a range of sophisticated technologies, tools and processes that are intuitive and easy to use. Like consumers, employees expect companies to offer simple, fast and streamlined experiences. Chatbots to answer basic employee enquiries and support the onboarding process. Like customers, employees want their needs to be met at the physical, social and emotional level. Organisations should develop deep and meaningful connections with their employees – to engage their hearts as well as their minds. As stated by Gallup CEO Jim Clifton “I think you’re going to find that what people really are seeking in return for work is love”. When designing employee experiences, especially in the ‘moments that matter’, it is important to evoke the right emotional response. Research indicates emotional energy drives employees to go above and beyond – regardless of compensation or benefits. Trust, pride and “feeling cared for” at work are all predictors of employee engagement, which will ultimately improve CX. Employees (especially millennials) are driven by purpose, passion and impact and are increasingly wanting a clear understanding of their role and how they can directly contribute to the organisation’s collective vision. They are demanding that organisations no longer focus solely on profit to the detriment of society and the environment and are seeking meaningful roles that enable them to have a broader impact. Be curious, start small and scale – A lot of CX initiatives have failed because they have overpromised and underdelivered. Start small and minimise the initial upfront investment. Adopt an agile approach that allows for experimentation and is scalable. Use a scientific data driven approach – What is measured is what matters. Implement rigorous measurement and evaluation of all relevant metrics for business, customer and employee. Results should be incorporated into current operating rhythms and given visibility across the business. Obtain executive sponsorship – It is important to have cross organisational support. Executive sponsorship is especially important, as employees will prioritise what is communicated as being important. Feedback – Collect employee feedback at regular intervals, in particular at the ‘moments that matter’. Acknowledge, action and advise employees of how their feedback is being used to drive change. Use employees to help co-design solutions and ensure their needs are being addressed. EX, like CX, is a journey not a destination. It will continually evolve with changing employee needs and expectations. Right now, your employees are engaged with customers in experiences that will shape their perception of your organisation. Whether they end up being positive or negative experiences may well depend on how well you have delivered on your employee experience. Karen Goldsworthy – Karen is a consultant and practitioner with over 15 years’ experience in developing, implementing and operationalising experienced based strategies that engage client and employee hearts and minds. Mark Priede – Mark has over 18 years’ experience as a consultant and human resources executive specialising in designing and executing people related strategies that help to unleash the full potential of individuals and teams and drive the achievement of organisational goals.